Freedom: Next time you’re debating whether to go to Reconciliation, stop for a moment. Remember who this God is that you’re going to talk to. JUST after 11pm, we heard a snap, a crunch and a few feeble squeaks. I looked at my housemate, whose face was white. She nodded, looking faintly ill. Both of us are vegetarians and despite being on excellent terms with most of the Australian wildlife that wanders through our backyard – we’re not huge fans of rats. Whatever had just met its fate in the kitchen trap (let’s call him Scabbers) would have to wait until someone less squeamish got home. Several days passed, and Scabbers was forgotten in a bedlam of essays and art portfolios. Forgotten, that is, until he began to decay. “It smells like something died in here,” I complained one morning while pouring tea – and then, horrified, remembered that something had died in the kitchen. My housemate tentatively ducked to look under the cupboard, and came up more abruptly than a whack-a-mole. “Yup, that’s him,” she grimaced. “It was cold? There were too many stairs between us and the kitchen? The idea was gross?” I fumbled through a few excuses – but really only the latter still applied. We were going to have to deal with the rat. Recently I went to the Sacrament of Reconciliation for the first time in too long. The excuses for the delay were familiar favourites: I can’t go with a priest I know well because he’ll judge me; I’ll just confess directly to God – He loves me, right? I don’t need an intermediary; well, nothing I’ve done is tooooooo bad, so I can wait a bit longer; I just don’t “feel” like it. But the longer I put off Reconciliation, the more sin started to feel like a forgotten rat under the kitchen cupboard impacting the quality of the air I was breathing. I noticed myself getting more complacent, impatient and egocentric. Life didn’t feel as fresh, and God seemed less and less desirable. I didn’t feel like I could trust Him, and the resulting anxiety was clouding my compassion. I was less thirsty for holiness and for mission, less convinced of my capacity to become a saint, and, come to think of it, was pretty sure sanctity was impossible for all of the irritatingly inept people around me. I knew the symptoms, and I knew it was high time to go see the Divine Physician to be healed – but, like the idea of dealing with Scabbers, thinking about Reconciliation was repulsive to me. The funny thing about sin is that it works in a spiral: the more mistakes I make, the less hopeful I feel about becoming holy, and so the more mistakes I consent to making. Looking at my sin is never what actually gets me off my bum to go to Reconciliation. In fact, looking at my sin tends to make me gloomier than ever, and more likely to resent God. Rather, the way Jesus wins me over is by casting a vision of “something more”. The night before my overdue confession, I talked to a friend whose clarity of thought and hard work for the Kingdom of God set a fire of fury in my soul. Their relentless pursuit of the greatest good reminded me of the vision I’d lost. It reminded me of the inestimable value of intimacy with God. And that vision of “something more” drove me into the confessional. God sees the potential we’ve lost sight of in ourselves. 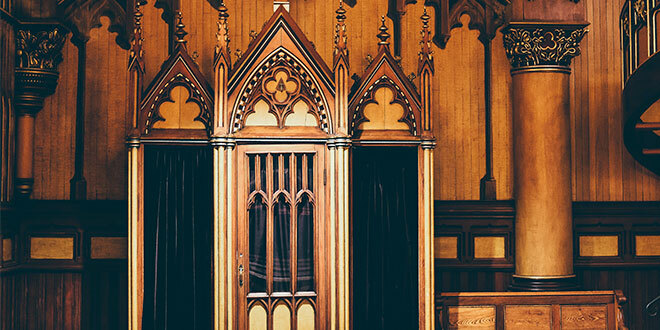 Whenever He calls us to the Sacrament of Reconciliation, we’re not hearing a summons to condemnation; we’re hearing an invitation to liberation. Our kitchen smells a lot better without a dead rat in it. Funnily enough, getting rid of the rat also gave us an incentive to mop the floors and clean up the stove-top too. Sometimes those sins that necessarily drag you into the confessional give you the opportunity to unleash God’s vision of beauty in other areas of your life too. Next time you’re debating whether to go to Reconciliation, stop for a moment. Remember who this God is that you’re going to talk to. For Him, it’s not about the list of petty mistakes; it’s about offering the freedom, mercy and clarity of vision we all need to keep running towards His arms.